The big news, right now (asides from Britain shooting itself in the head, Trump insulting everybody, and some rich git I've never heard of failing at hiding his name from accusations of sexual misconduct) is that RISC OS is finally going to become open source. The first restriction is rubbish. Due to how RISC OS is built, and how tied the entire API is to ARM, there is nobody on the planet who is going to "port it to MIPS for the lulz". The simplest way to get RISC OS on any alien platform is to write an emulator. Anything else is a whole bucket of crazy. The second restriction was seen as a show stopper by the freetards of the world. You mean, I need to PAY for this? Actually, no, probably not. I haven't paid a single penny. Because I'm not selling RISC OS or anything with RISC OS inside. This restriction only affected people making commercial use of RISC OS, not random developers wanting to play with it. So that it was a screeching roadblock and a giant barrier to entry is rather untrue. RISC OS' Castle licence is - this weekend - going to be replaced with the Apache 2.0 licence. For those who don't fancy making sense of the legalese of the licence, it essentially boils down to "do what you want, just don't sue us". Now, people are saying RISC OS is "finally" open source, because the Apache licence fits in with their personal definition of Open Source (and the OSI definition). Given that I've had the sources on my media for years, and have built my own ROMs with my pet peeves fixed/altered, I gotta say - their definition is more political than logical. So to big hoo-hah, RISC OS will finally become an OSI accepted definition of "open". It will become a hell of a lot more open than GPL is ever going to be (if it wasn't for the CDDL code within RISC OS, one could legitimately choose to put their copy of RISC OS under GPL; the same is never true of anything licenced as GPL). RISC OS will be freeeeeeeeee! So now the 'tards will be complaining that the official build environment (DDE) is a commercial product. One is forced to pay fifty quid for it. Technically true, but technically false. The DDE does cost, but if a real developer arrived with a responsible and coherent plan for implementing something like a DNS resolver that works in both directions, AirPrint support, or WiFi/Bluetooth/etc, I am quite sure the community will be able to get something happening in that respect. Indeed, one ROOL forum member suggested the possibility of sponsoring a DDE licence to a serious developer. So, no. I don't agree that the DDE should be free. Because if it was, the big barrier to entry would be our crappy build environment and lack of tools (smile when you use the debugger, because you're getting Punkd, right?). And if somebody funded porting the best modern IDE available, then the barrier to entry would be the memory protection, or lack of it. Or the co-operative multitasking. Or the how-the-hell-can-you-in-2018-use-cvs (come on, it's better than zip files). Or the fact that it's a massive pile of 32 bit code with no 64 bit support. Blah, blah, blah. You see, there is always one more excuse to make. One more reason to promise the earth and do nothing. Leave your trendy frameworks at the door along with your programming paradigms du jour. 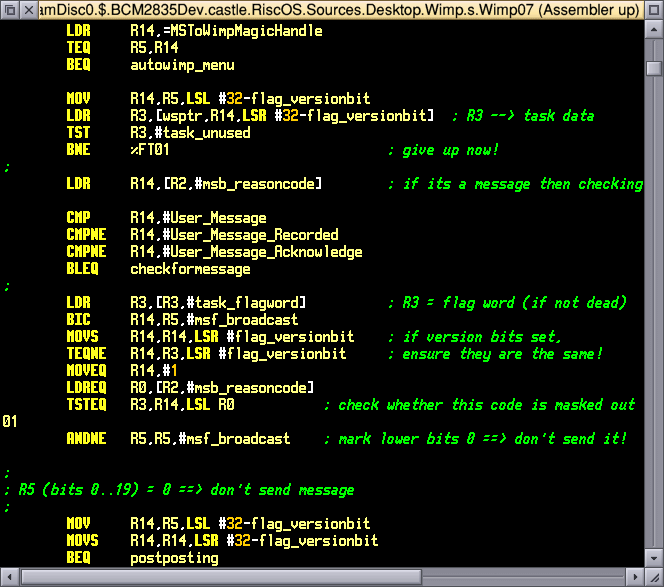 The reason RISC OS is ridiculously lightweight (the entire OS runs to a ROM image of around 5MB) and blindingly fast is because the majority of it is written in hand-crafted assembler. The language of the ARM processor. Yes, it is a maintenance nightmare because one can't just recompile to new platforms, but on the other hand it was originally written in 1987 (as Arthur) to run on the new Archimedes range. Back then, writing stuff in assembler was not unheard of, and compiler technology was such that using assembler was often better. RISC OS grew from that humble beginning and... it is what it is today. To be brutally honest here, I see this announcement as something of a non-event. Okay, RISC OS is now owned by RISC OS Developments so it's a subtle change in direction to make the codebase OSI open source, rather than the previous with-conditions format; however the much bigger news, I feel, is that the rights holder of the 32 bit realm and the rights holder of the 26 bit realm are now talking to each other. Maybe, after far too many years, it's soon to be time to bury the hatchet and leave the past where it belongs. That news is the part that has me excited. But I guess you need to understand RISC OS' history to know what that is important. It's easier to go "oooh" at the announcement that the source code is now available to the world...as if it hasn't been for the past... how many years now? I was given a DDE licence by a very generous sponsor even though my contribution to RiscOS is pretty minimal. The second time he offered to purchase the update for me I thought long and hard about it and eventually turned it down on the basis that there are more deserving cases. I hope that I didn't offend him too much. Add a comment (v0.09) [help?] . . . try the comment feed! Validation Are you real? Please type 98913 backwards. Last read at 10:09 on 2019/04/23.